The bulk of said documents are normally those that require signatures, like contracts, tax forms, reimbursement sheets, and — well, the list is seemingly endless, which also means that the work allocated to creating and organizing them also never stops. A simple solution? Electronic signatures or eSignatures. Having the same legal weight as handwritten signatures, eSignatures could revolutionize the way you do business, and could potentially pave the way for more profit and innovation. And using a renowned tool like HelloSign can help ease your journey in the transition. If you're apprehensive about dotting your i's and crossing your t's digitally, that's totally normal. Here's why you should do it anyway. Just think about all the time you've wasted waiting around and signing documents when you could have invested in more fruitful tasks. Switching to digital legally binding documents streamlines your workflow, and results in you no longer having to deal with long approval chains, following up with concerned parties, endless printing, scanning, and repeating the process all over again. It gets exhausting just thinking about it. 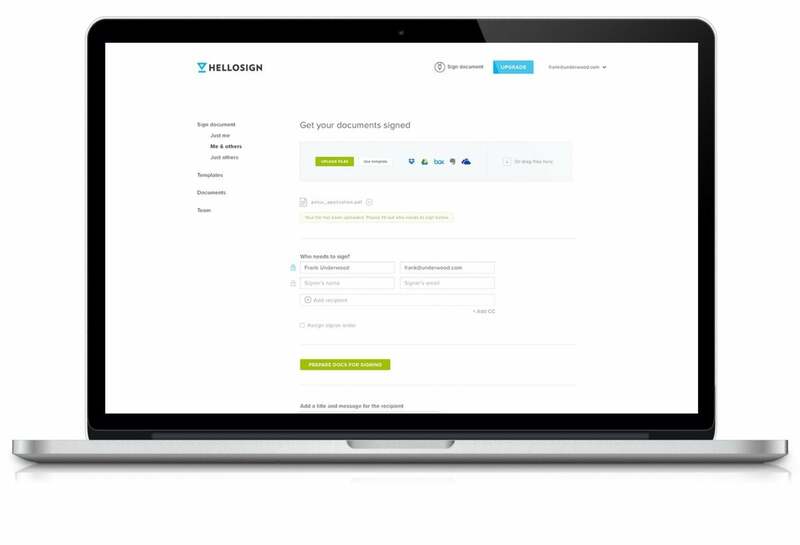 With HelloSign, not only will you be able to automate signature requests, but you’ll also prevent human error by incorporating editable and pre-populated custom fields. You can also use templates to avoid creating the same documents repeatedly, and integrate with your favorite apps like Google Drive, Dropbox, and Evernote for file management. HelloSign even lets you set up notifications. That way, you won’t have to spend hours on end staring at your inbox, waiting for that file you need to sign. 2. You'll reduce overhead costs. How much has your company spent on paper? Printers AND printer repair? Ink? You know the answer: probably more than you should have. In fact, it's also likely that you're paying someone to do those administrative tasks like printing, faxing, and filing. Pivoting to a truly paperless work environment and using HelloSign will be more cost-effective and efficient because you'll get to save the money spent on paper and invest it instead on processes that increase profit. You'll even get the chance to help out Mother Earth while you're at it. Oh, and here's a little secret: companies who move to eSignatures increase revenue by 8% in their first year. It’s a win win. 3. Provide better customer experience. Getting someone to agree to sign something is tricky enough; just imagine how tedious it would be for your clients or contractors to sign stack after stack of documents. It's already a cumbersome process for you, think about how overwhelming it would be for them to be deep in the throes of paperwork. Don't risk facing client drop-off by leaving them frustrated with such a complex workflow. Automate your entire operation and treat your clients to a better experience. HelloSign can help you with that by digitizing the necessary paperwork and allowing the people involved to sign everything in a clear, orderly manner. Introducing eSignatures to your process also equates to improved efficiency among all teams across your company. Each faction can save hours, days, or even months of precious billable hours chasing down signatures just by crossing over to digital and embracing electronic signing. If you truly value efficiency and productivity and want to reduce the time and cost it takes to complete transactions, make eSignatures a part of your company's DNA. It's a no-brainer. Your team can then redirect their attention to things that matter more. Fun fact: HelloSign was voted #1 for ease of implementation by G2 Crowd two years in a row, making it the top eSignature vendor when it comes to user-friendliness. Employing eSignatures would already make things easier for your company and clients, but choosing an intuitive platform for it? You'll be unstoppable. The platform only requires you to upload or create the document, populate the necessary fields, and assign people whose signatures need affixing. Users are then allowed to sign from anywhere, at any time, on any device. Best of all, it’s in compliance with major eSignature laws including ESIGN, UETA, and European eIDAS. All signatures are secure, legally binding, and encrypted to the highest degree.